Prostate Cancer Diagnosis - Do you Really Know "All" Your Treatment Options? A generation ago the standard of care for Prostate Cancer was the Prostatectomy- the surgical removal of the prostate. More recently a minimally invasive therapy called Brachytherapy has become the standard of care. This therapy is a form of radiation therapy where radioactive seeds are implanted in the tumor permanently. Remission rates have been shown to be better than for surgery and the therapy comes with fewer side effects. Meanwhile, Dr. Andrew Loblaw and his colleagues at the Odette Cancer Centre at Sunnybrook Health Sciences Centre in Toronto have been working on an innovation in the way that external beam radiation is applied. This innovation is called SABR. With much better targeting it has been shown that it is possible to administer much higher doses per session while reducing the number of sessions. More importantly, SABR increases remission rates and reduces side effects matching or improving on those of Brachytherapy. A large international trial of SABR including Odette as lead Canadian centre is well underway and it is expected that the results will be no worse than Brachytherapy and possibly better. If so, it is likely that in the future SABR will become the new standard of care for prostate cancer. Interview with Sunnybrook oncologist and PCF Chair, Dr. Andrew Loblaw. AM 800's Peter Langille interviews Dr. Junaid Yosuf about the SABR prostate trial. ​Dr. Theos Tsakiridis talks about the upcoming SABR Prostate Trial at the Walker Family Cancer Centre. 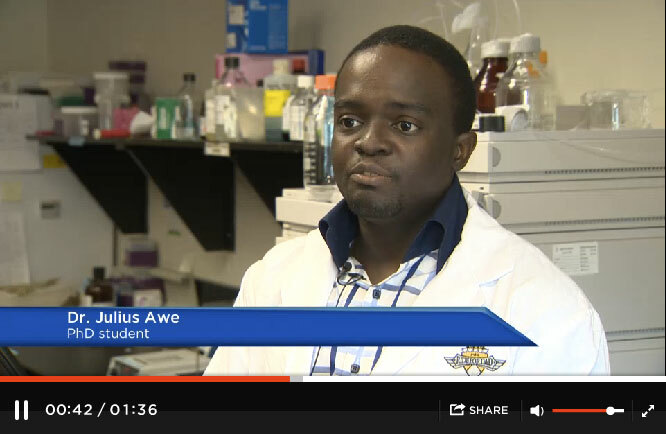 Groundbreaking prostate cancer research being done in Manitoba. CTV Health Reporter Pauline Chan visits Dr. Andrew Loblaw at Sunnybrook Health Sciences Centre to see how SABR works. ​PCF’s Dr. Andrew Loblaw spoke with host Val Cole on the benefits of SABR. It was a chance to raise funds, awareness and enjoy a perfect day for a motorcycle ride across the region. The Telus Motorcycle Ride for Dad rumbled its way through Niagara region on Saturday, with more than 200 motorcycles taking part in the poker run event which started at the Royal Canadian Legion, Branch 124 in Niagara-on-the-Lake.